An Intercooler is a must for any uprated Turbo, please see “Choosing the Right Intercooler” below or contact us for more information, we would be delighted to discuss Intercooler options for your car. The purpose of a Turbo is to compress the air in order to get more oxygen per cc however the heat and pressure generated by high performance Turbos causes excessive expansion of the charge-air, resulting in less oxygen per cc. An Intercooler gets the air temperature down thus raising the air density and oxygen per cc. Overall power and torque increases up to 60% are attainable when fitted alongside an appropriate ECU Remap and Turbo boost upgrade. Adding a performance Intercooler can make a tremendous difference to your car’s drive-ability. You need the right Intercooler to achieve sufficient temperature drop while minimizing pressure drop. On a street car you may be looking at up to a 2.5-psi pressure drop and efficiencies of around 60 percent. A rough “rule of thumb” method is to allow 6 to 7 square inches of internal Intercooler flow area for every 100 Hp, but this can increase by up to 40 percent with really dense internal fins. 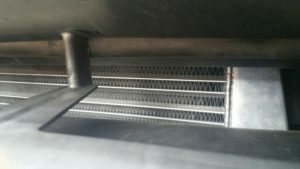 In theory, air-to-air Intercoolers can be located anywhere between turbo and engine however, they are most effective where there is better airflow, usually at front, behind the grille. Please call us to discuss your requirements. 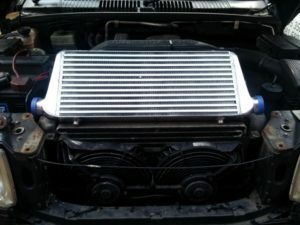 We can advise on all the options and recommend the optimum Intercooler setup for your system in Worcester.